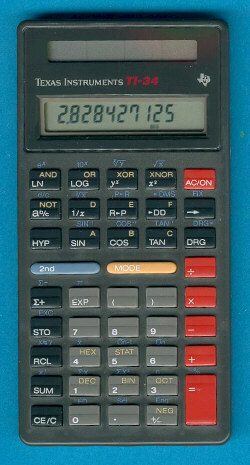 This late TI-34 manufactured in Malaysia uses smaller solar cells compared to the original TI-34 introduced some years earlier. Nevertheless this TI-34 with the old design was manufactured in May 1998 - the production of its successor started already in 1996. Don't miss the more stylish TI-34 assembled in China. Fellow collector Nowm Watts reported recently a TI-34 with the same appearance manufactured in China. Its date code T-0892 suggest Toshiba as contract manufacturer! © Joerg Woerner, March 25, 2003. No reprints without written permission.